Lets Culinate ! : Why Newspaper or Cook Book Recipes Just Wont Cut It ! Why Newspaper or Cook Book Recipes Just Wont Cut It ! Are you a home cook with a knack for experimenting new dishes?If the answer is yes i am sure you have ever been moved by a wonderful recipe some where complete with amazing photos on a food blog/website, newspaper page or recipe book and perhaps thought to yourself you should recreate it. Many of us have and often we are just not able to "hit it" like it is on the source page.You may wonder why? 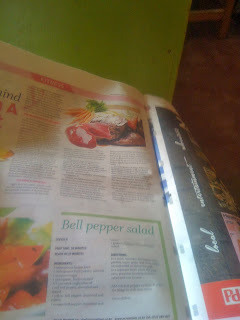 Being a weekend , i like to skim through the newspaper pages on the society, lifestyle and fashion pages.Today's dailies had fancy pages on good food.The Daily Nation actually had an interview of a professional Sous Chef with one of the popular restaurants around who loves cooking Italian Cuisine/foods and he made recommendation on how to Cook a Duck Confit with some Tortellini .The Standard on the other hand had this nice caption on making a Assorted Bell Pepper Salad. Behind those fancy photos are professional food stylists (many with a professional background in food)and photographers who tweak the dishes and the photo to ensure maximum visual appeal.This Readers Digest Post may perhaps hint you on some of the tools of the trade.Well its true you may reason that perhaps you may not be able to recreate the look but at least you will be able to cook what is presented.In this regard you are also wrong,and here is the reason why! A good cook must have background knowledge on the type of food he wants to cook,the technique and some reasonable experience in preparing the dish or similar dishes of a similar nature.Knowledge is key. For example the recipe for Bell Pepper had some instructions on mixing vinegar,black pepper and some oil.In essence this means creating a dressing .Now without some hindsight basic knowledge on salad dressings in particular emulsions. A home cook may attempt at making a dressing but it will come no close to someone who has background knowledge on emulsions, how to mix them, keep them stable, flavor them and the appropriate vinegar/oil ratio's. All that information is not and will not be included in a recipe and often are not explained in many recipes that you will come across.The assumption is you already know these things or based on trial and error you may just hit it if you closely follow the scanty instruction.Often than not that happens! 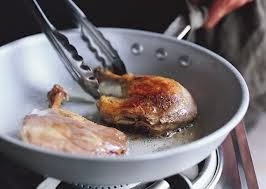 Example two: the Chef interviewed today on the Daily Nation made a Duck confit(French confit de canard) recipe, truth be told based on what you have on that page you will not be be able to make half what can be called a duck confit(better try that Wikipedia reference page...heh heh!) .Without some knowledge on browning meat, why you do so,shallow frying, basting and slow cook stewing techniques one can come nowhere near making a duck confit!Traditionally the duck confit is actually fried using the ducks own natural oil with constant basting and then slow cooked hours on end.I laughed when i read through the recipe and wondered whether a home cook can recreate that dish with so little instruction given.No wonder i have come across some home cooks and half baked local culinary school graduates turned " culinary professionals" preparing some fancy named dishes which come no near the self acclaimed titles. Trial and Error route which is most complex and hardy route.Typically a waste like trying to reinvent the wheel.There is already an existing vast body of knowledge on various food,cooking techniques and presentations.Make use of that otherwise subject yourself to trial and error which pretty much depends on your palate and environment. Become an apprentice of someone who knows how to prepare the dish it may just rub on you. Learn how to ...join some reputable cookery school and that could even be online.You may just be pleasantly surprised with the body of knowledge in some of the social media sites such as Youtube...great video instructions.Cook Cook Cook and improve on your cooking. To culinate awesomely dear cook- there's no shortcut, recipes alone wont do it.You just must understand food,why you do what you do.Doing so will turn you from a nice cook to an awesome cook.Hence this blog will attempt not just at putting here recipes ,nice food photos but get you to understand some cookery basics and the reason why you do stuff. "This is not just another food blog!" If you consistently read through the posts for example on "perfect seasoning"" Mirepoix and Soffrito" you will soon grow your body of knowledge on food and turn from an average cook to an awesome one.Keep reading and constantly refer.Make it worth the while !